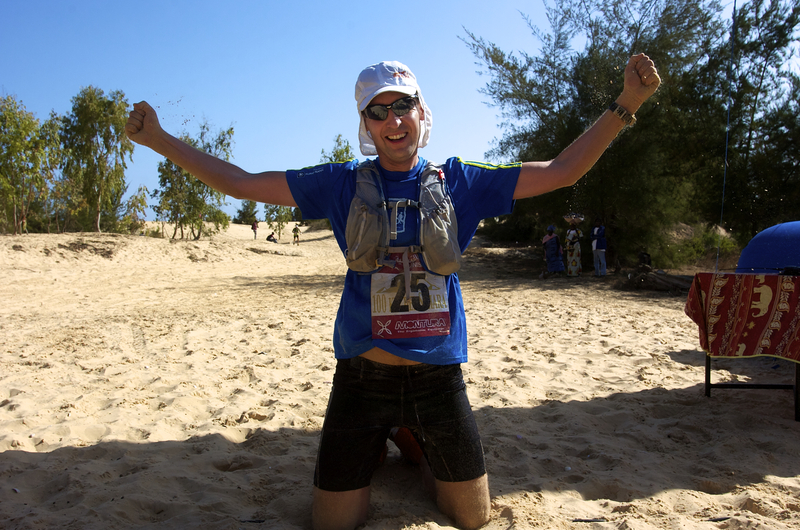 In a previous article I described how I came up with the idea for the 100km stage foot race in the Sahara desert and how I was preparing for it. I take a plane to Dakar at the very west end of Africa. All the participants gather at the bus waiting at the airport. I meet Thomas Wittek there who arrives with another connection and get introduced to Jörg Balle, another german, who won the race several times in the past. There are around 60 participants, mainly from Italy, but also some Germans, Swiss, Belgians, even people from Spain, Brazil, Netherlands and Dominican Republic. I have registered with my polish pass. Why? Well, I wanted my polish friend to prepare and share this experience with me. He didn’t want to. I said, “Look! You would be the first and only Pole who finished that race!”. I didn’t convince him. So I tried to blackmail him into it saying: “If you don’t run, I will register as Pole and I will be the first and only Pole who finished.” Also this didn’t change his mind. So I had to stand to my word and register with my polish pass, which I did and here I am, the only Polish person in the history of “100km del Sahara” so far. The bus takes us to a small village at the dunes of Lompoul, where we get into four wheel drive trucks and head to the desert camp in the dunes. The trip alone is kind of an adventourous desert safari. We spend the evening with some traditional food and music, at the fireplace. We sleep on relatively comfortable camp beds in high standard tents in Mauritanian style, each equipped with a shower and a small restroom. The dream I have nurtured for so long seems within arm’s reach. But now, it seems so unreal for me to be here. Am I worthy of it? I am too excited and probably also too intimidated to strike up conversations with other participants this night. I am more of an observer looking in admiration at those superhuman ultra runners. I don’t feel like I belong in this community. There is too much of awe in me. I prefer to keep close to Thomas, whom I know. He is given a special tent for the top runners. Understandable, since he won the previous edition of this race. Only Micha, a friend from Switzerland also sleeping in my tent seems to be on a similar level and we chat a little bit. First leg of 11km starts at 8am. We need to get up early to get prepared and eat something before the race. It is all in the dunes race, right from the beginning to the very end. Good I have prepared in the Dunes of Maspalomas in Gran Canaria, so the extreme taxation in the dunes isn’t a surprise for me. What surprises me is the speed people attack the leg. I am very quickly in the red zone and decide to run with my own speed. Surprisingly also I am not the last. From time to time there are children from the neighbouring villages cheering us. Especially the many Italian organizing staff shouting along the course: “Bravi! Bravi! Signiori maratoni!” give me additional energy boost. I am especially satisfied with my performance running up the dunes, with my fight weight of 81 kg. And I finish 19th out of 57 participants. It is much better than I have expected. Especially to the end of the leg I got stronger than the people around me and could overtake some of the people in front of me. And I get Micha literally on the finish line scoring the same time. If they could do it, and I can see I am stronger than them now, I surely can do it also. My perspective changes rapidly. What seemed unimaginable and crazy before I got into this community, now after meeting and befriending these people, seems quite doable, certainly closer to “normal” when looked at from my new perspective. These are the things these people just do. And I somehow start to feel I belong to this community and I can do them also. Two years later I will be giving a lecture with the title “How to do The Impossible” and one of the methods I advice there is just to get into community of people doing such things. It helps to change the believe of what is possible for you and what not. If others can do it, you can do it also. Talk to them and you will find out how to do it. Also it will change your perspective of what is crazy and what is normal. But it is only the first 11km. It is too early to say anything. Tomorrow is the leg I am afraid of. It is the marathon distance run through the desert. Until now I have run a marathon distance just once, in Athens, on the street. 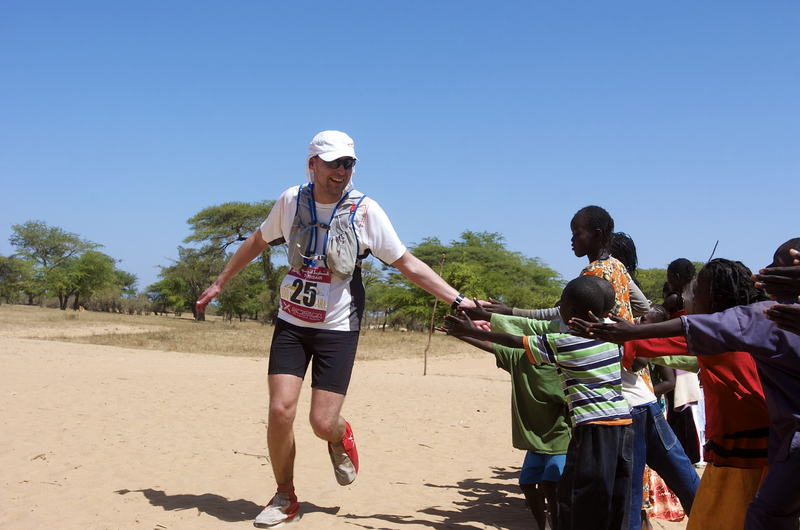 But 42km on sand, in the burning heat of the African sun? I somehow can hardly imagine me doing it. We start at 7:15 in the morning to avoid the worst heat. We are warned by the organizers of the hard spikes of cactus-like plants, creeping in the sand. They tell us not to step on them under any circumstances. Some of the runners in the previous editions did and the spikes pierced through their shoe sole, through their feet and through the shoe again, protruding on the top of it. Nothing really pleasant to experience. So this is an additional difficulty in the race slowing you down. I decide to run with a speed way below my normal marathon speed. I discipline myself not to run faster than 7 min/km for the first half of the marathon. It looks like the Russian participant Alex Kirill has the same strategy. We run together, pass some villages with huts made of sticks on the way, like in the African picture book. We high-five the hands of many children in these villages. Entire school classes took free to greet us running through their village. It is a seldom event for them. We run through a splendid african landscape of Sahel, an unforgetable beautiful, but also very dry area. Around kilometer 10 I spot Jörg, who always runs the high-speed with Thomas, walking. He tells me he has suffered a muscular injury in his leg. After 15km Alex starts to speed up a little. Apparently it is to slow a speed for him. It is also a little unusually slow for me, but I remind myself of what I have promised myself. Not to overpace. I can always speed up in the second half if I feel good. It is 36 Centigrade in the shadow. But there is no shadow. Micha comes in 1,5 minutes after me and Alex finishes 16 minutes later. He has a serious energetic, maybe even circulatory problems. He is white pale and hardly reacting to the world around him. I get him a vitamin drink full of electrolytes which should restore him. Then we have a nice lunch at a desert villa and head to the hotel in Saint-Louis, the former capital of French West Africa. We stay in a wonderful Hotel de la Post full of aviation souvenirs from the time, where Saint-Louis was an important airport for atlantic crossings. Now I know, the hardest part is behind me. If nothing unexpected happens I should be able to finish the race, something I have considered impossible, unimaginable just a year ago. My longest distance run in one day has been a marathon (42km) until this date and the most difficult running event this event now. They are telling stories about 200+ stage runs or runs with distances of 80km and 100km run in one piece. This is something I can’t tell a single story about. I just have never experienced with. If I want to significantly contribute to these conversations, I need to start doing these things. So it is not only about seeing it as doable, now I start to feel an urge, a necessity to do it if I want to be accepted in this community. It is somehow the herd mentality turned into advantage. The third leg takes place at the bird reserve of Djoud National Park. Distance: 24km. We start at 7am and the temperature quickly rises to 36 degrees, just like yesterday. I remember before I decided for this event I couldn’t imagine running a marathon, and then more than a half marathon the very next day. It seemed a major challenge. But surprisingly, today I am in a perfect shape. Fresh and ready to attack. I decide to save on water weight which almost ends up in defeat for me. I leave out the water station at the kilometer 10 thinking there will be one more on the way. But there is just this one water station and I run out of water. No water, no run. It gives me quite a shock. Fortunately 1-2 km after I run out of water I spot Jörg again. He again has problems and will be soon picked up by the organizers. We exchange our camelbaks. His is an old model, very inconvenient, but it has a major advantage over mine: water inside. Now nothing can stop me. I speed up and catch up a group running before me. My strategy is to run past them so fast they don’t even think of keeping this rhythm. Of course I don’t have power to run like this all the way to the finish line but it isn’t necessary. After I get some distance over them, I can slow down again. Nevertheless, one of the guys tries to keep my pace. I speed up again and manage to drop him. Then, 200 meters further I slow down again. I finish in 19th place this time. It looks like I manage to come under top 20 in every leg. We transfer to an interesting hotel at Lac Rose (Red Lake), where we are put into nice round bungalows, each equipped with large canopy bed and a bathroom. The Red Lake is a salty lake in the very vicinity of the ocean where you can lay effortless on water without sinking. The last, fourth stage is 20km again, a big chunk of it run in the dunes and on the ocean beach. It is also the course where the Paris Dakar Really used to finish, before they moved it to Argentina. At the starting line, just 5 minutes before the start I realize I forgot my starting number in the room and have to run back to find it and then attach it. I almost miss the start and practically run half a kilometer longer than needed today. We go around the lake and then on the other side between the lake and the ocean, through the dunes and along the shore, then again through the dunes to the finish. I don’t have the same motivation today. Apparently, I am enjoying it too much, breathing the air of success, sucking in this exceptional atmosphere, the emotions, burning this unique experience into my brain. I know the heavy preparation has paid off. The moment I reach the finish line all the hassle, all the grinding will be over and I will be able to rest, relax and look back at what I have achieved. 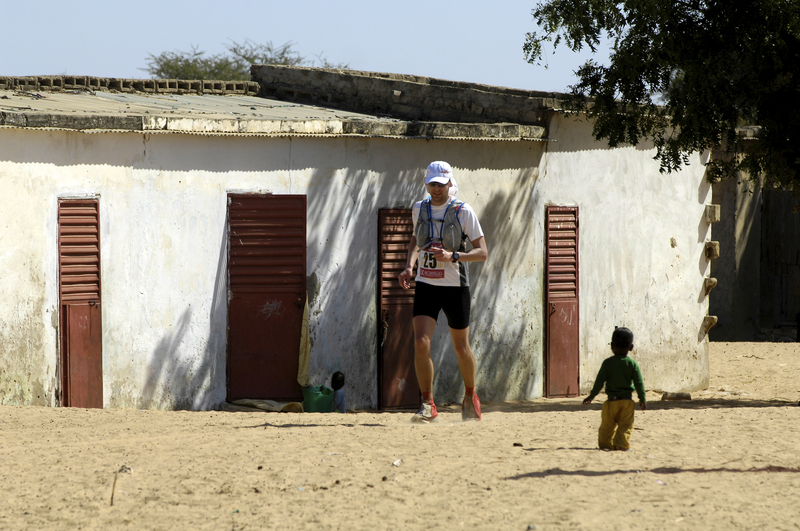 It was a long way between seeing Thomas Wittek in the newspaper running this 100km race in the desert of Sahara and me finishing it myself, here in Senegal today. I feel so infinitely proud when I reach the finish line, that I hardly pay attention to my placement. Later on it turns out I took the 18th rank in the overall classification. Not bad for the first time participant. My goal was just to survive. I hugely exceeded my own expectations. And I take two lessons from this event with me. This is how I started my ultra running career and this is how I once again accomplished something I deemed impossible for me just months ago. I wonder how this story inspired you. Please share your impressions, remarks, conclusions with me and other readers in the comments below. I will also happily answer your questions.